On the morning of September 3, I received a text from a friend that read “It’s official” with an attachment to The Hill’s early reporting on President Trump’s DACA decision. My heart dropped. I felt heartbroken, angry; defeated but determined. On one hand, I wanted to throw up my hands in defeat, but on the other, I knew I had to do something to show that this would not stand. 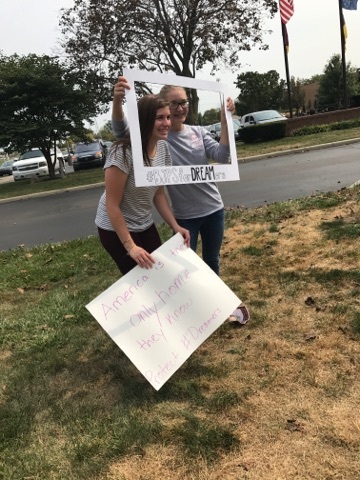 On August 30, my friends – Casey Ernest, Elaine Esposito, and Mary Claire Molloy – had invited me to help organize a rally for immigrant rights at Brebeuf in response to President Trump’s order. Casey and Mary Claire heard about the issue in their religion class in the morning and were immediately inspired to do something about it. 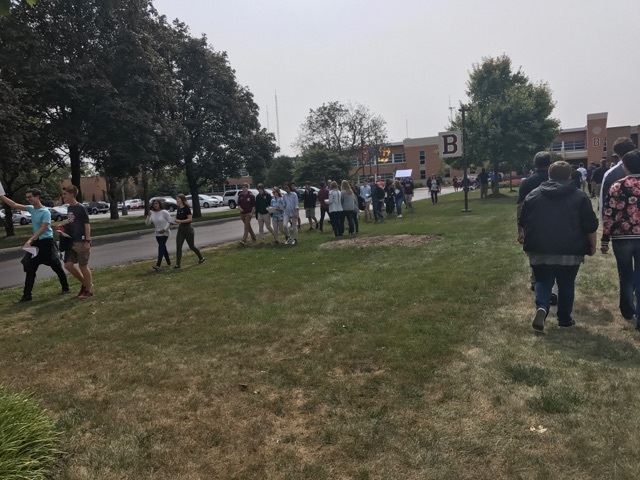 Initial planning meetings started with Brebeuf’s Director of Community Service, Nick Klingler, on August 31, five days before Trump’s decision deadline. It was clear that he would most likely eliminate DACA, but we didn’t want to plan specifics because we were hopeful that he’d surprise us. 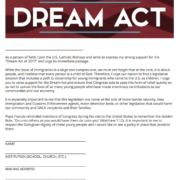 On September 5, President Trump officially declared that the Deferred Action for Childhood Arrivals program (DACA), created as a result of President Obama’s presidential order, would be ended after a six-month delay. This means that 800,000 individuals brought to America by their parents could be deported despite having been raised in the U.S.
We started planning the rally for a 15-minute period the following Monday. 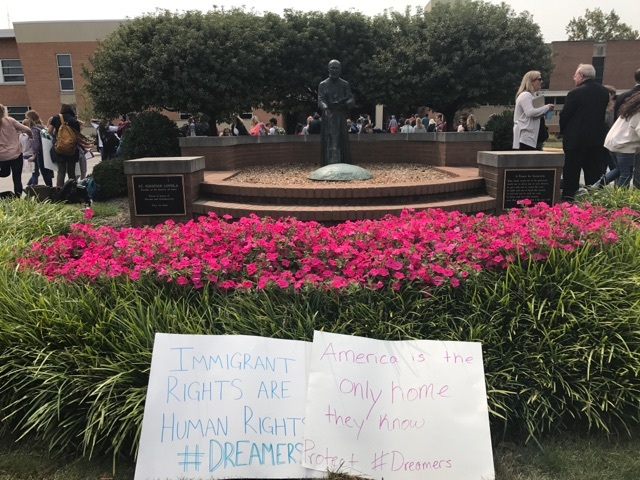 We reached out to teachers, club leaders, and class presidents and invited them to attend Brebeuf’s Rally for Immigrant Rights. After finding a date, we thought more about the takeaway from the rally. 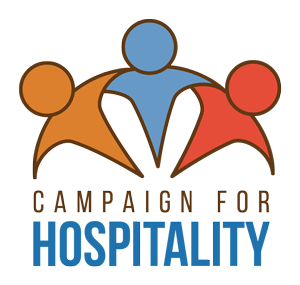 Our main goal was that people leave with the intention of contacting their representatives as soon as possible. To achieve that, however, we needed more people to be educated on the issue first. 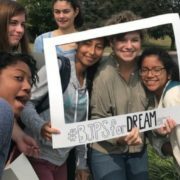 Mr. Klingler, director for community service at Brebeuf, contacted the executive director of the Indianapolis Immigrant Welcome Center, Terri Morris Downs, to speak at the rally about DACA itself, what it meant for Indianapolis, why its reversal was so harmful, and finally why student advocacy was so important. By inviting leaders on this issue from our community, we were able to spread the message to a larger audience than just the students at Brebeuf. Downs gave a brief overview of the issue, then discussed how it is the responsibility of those with privilege to stand up for those being discriminated against. On that note, we started marching. Brebeuf senior Ana Mendoza led the group in chants as we circled the lawn. We chanted “No hate, no fear, DREAMers are welcome here!” as people took videos and pictures with our “BJPS for DREAMers” Snapchat filter. It was a very high-energy, inspirational, unbelievable 15 minutes. After the rally, everyone headed inside. It was then that we really saw the impact of the rally. Even the moderator of the Young Republicans club remarked that he was impressed. Administrators discussed how proud they were. However, those were not the only people giving us feedback. 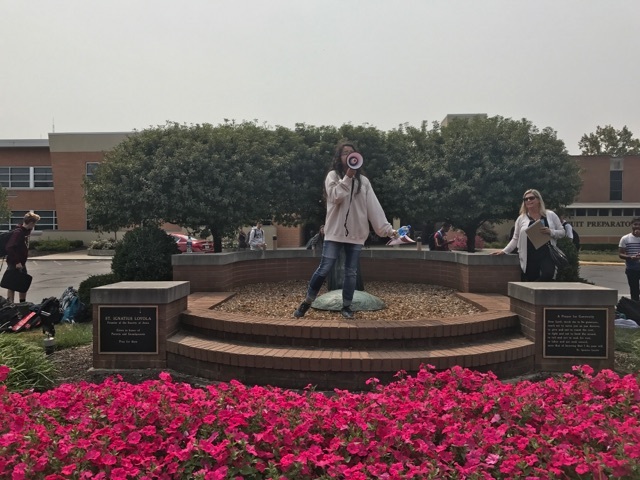 Some students were upset that the rally was hosted on 9/11. They went to the administration declaring that we’d disrespected the President, the military, the victims of 9/11, the families in mourning, and the flag. They were upset that we did not pause for a day to remember the lives lost. We wanted the takeaway from the rally to be that students contact Congress to share the news of our rally; we needed to be on as much social media as possible. For me, though, this became a surprisingly difficult task because of the bad feedback. Even though I knew there were more positive comments than negative, it was difficult to stop playing the negative feedback over and over again in my head. I started telling myself that any post I made wouldn’t make much of a difference so it wouldn’t be worth it. For two days afterward I was radio silent on my social media out of shame and fear. 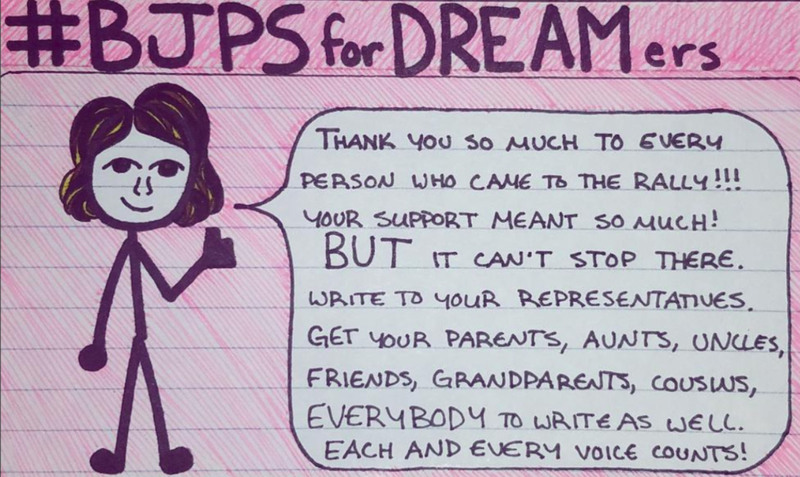 A sketch created by the author for social media, encouraging members of the school community to take action as advocates for Dreamers. After two days, I took a deep breath, drafted my Instagram post, and sent it out to the world because I knew the rally wasn’t about me. It wasn’t about making everyone happy. It wasn’t about 9/11, a day that should never be turned into a time of paralysis and silence. It was about protecting the 800,000 young people at risk of being deported, and even if my post was not going to make or break Congress’s decision, it was my responsibility to do what I could. The feedback I received was all positive. People from my rowing team asked about what the rally was, why that issue was important, and what they could do. We succeeded. We created dialogue and promoted understanding specifically so that we could communicate to Congress our beliefs about what they should do. News of our rally was posted on Snapchat, Instagram, Twitter, and even Facebook (thanks, adults!). Support came from all sides and most importantly there were lots of people contacting their representatives. For the group that helped organize the rally with the help of Mr. Klingler, this experience showed just how much high school students can do. Activism is not about age or experience but about dedication and a willingness to do what is right. Brebeuf demonstrated that not only are we willing to speak up and use our privilege for the betterment of society, but that we are able to. 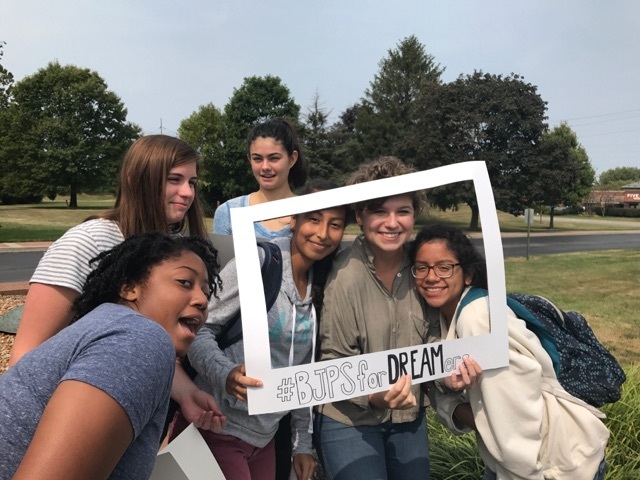 It ignited a new passion in Brebeuf’s social justice club and provided an example of what our work could look like in action. Sophia Ferries-Rowe is a student at Brebeuf Jesuit Preparatory School in Indianapolis, Indiana. Editor’s note: This piece was originally published by the Jesuits East and is republished here with permission. 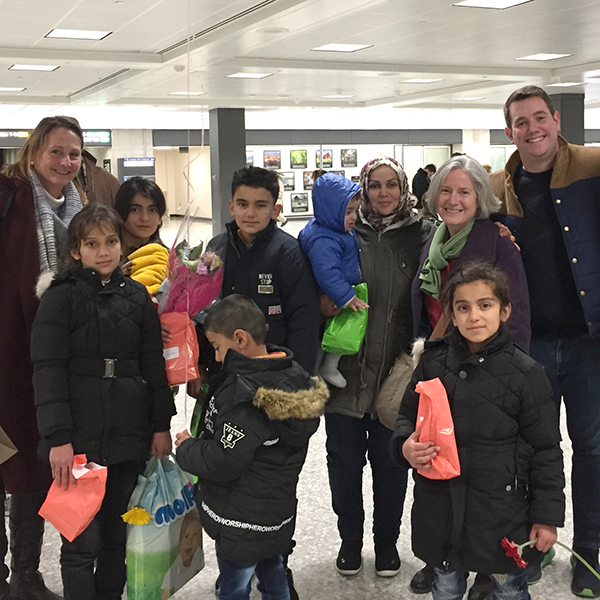 Although nearly 6,000 miles away, Holy Trinity Catholic Church in Washington, D.C., responded to the needs of a family in dire straits—a Kurdish family of eight from Syria desperate to find a safer life far from their war-torn region. As parishioners at a Jesuit parish, the Holy Trinity community felt a personal affinity to Pope Francis’ call to help those caught in the ever-escalating global refugee crisis. When they became aware of a Syrian family hoping to flee a daily existence of constant danger, they did more than offer prayers; they reached across that 6,000-mile divide. “Our parishioners responded whole-heartedly to the pope’s appeal for action,” said Holy Trinity Pastor, Fr. Kevin Gillespie, SJ. “And when things looked bleak, no one gave up.” Filling out forms, tracking down housing, finding schools, and organizing donations were only some of the challenges. The Trump administration’s temporary travel ban put an indefinite hold on getting the family on a plane. “The constant uncertainty is what I think affected everyone most,” explained Kate Tromble, Holy Trinity’s pastoral associate for social justice. 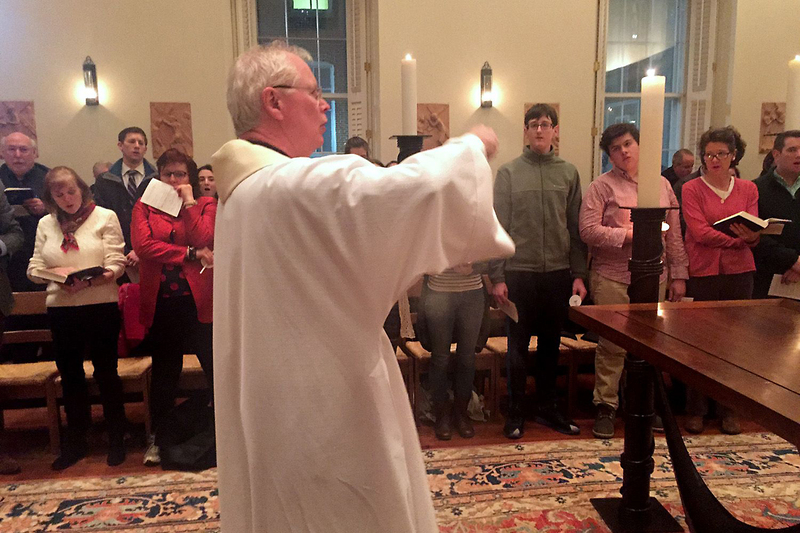 “Their arrival hinged on so many factors; it was emotionally exhausting at times.” When hope seemed to fade for a few days, waiting and wondering if the family’s exodus would ever happen, parishioners came together for a prayer vigil with Fr. Gillespie and Fr. 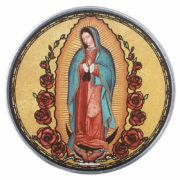 Leo O’Donovan, SJ, of the Jesuit Refugee Service/USA, praying that God would safely deliver this family into their care. 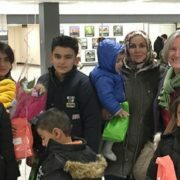 Receiving this Kurdish family at the airport was akin to a long-awaited homecoming, complete with gifts and tears of joy. And despite the hard language barrier, love needed no interpreters. It was clear to both sides that the bond shared here could only stem from unconditional love and acceptance. Holy Trinity’s commitment to this family was far from over. “There are many phases to helping refugees like this,” Fr. Gillespie said. “Assistance goes far beyond just getting them here. We have to help sustain them for the future.” Indeed, the family needed to get set up in their new housing, learn the neighborhood, acclimate to our culture and standards, start school and language classes, find work—and the list goes on. Bumps in the road were expected and realized—from needing doctors for sudden medical conditions to finding a child lost in town—but progress continues to be made. The children are all in school with one making honor roll, and parishioners are helping the parents find gainful employment. Mike Gabriele is director of communications for the Jesuits’ Maryland Province. 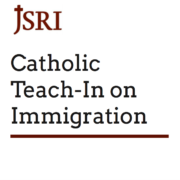 The Catholic Teach-In on Immigration aims to create a “culture of encounter” that leads to greater understanding and empathy on the issue of undocumented immigration by bringing together undocumented immigrants and U.S.-born Catholics in a prayerful, intimate, and safe place.